The sun in shining and today’s (Saturday, April 20) walk to the Basin will be leaving Crozet Park at 10. Join us for a look at spring, right in our back yard. We have a workday this Saturday, March 23 at the Creekside trail in Old Trail. Besides general pruning and trimming, we will be assisting the Blue Ridge Home Builders Association to build steps from Birchwood Hill Road to the trail, greatly improving access and safety on this steep slope. Meet at 9 am on Saturday at the corner of Wellbourne Lane and Birchwood Hill Road in Old Trail. BRHBA also plans to work Friday 3/22, 9 am to 3 pm if you are available to help out. 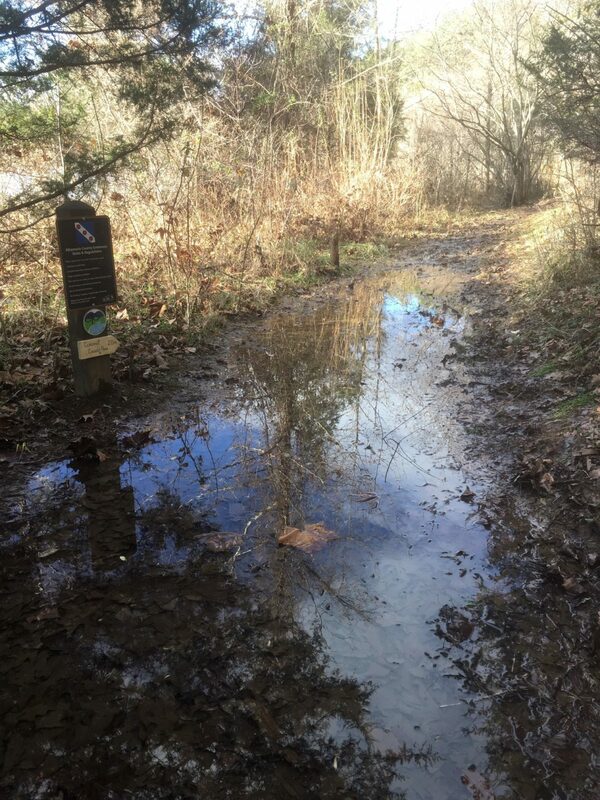 We will be improving drainage on the soggiest parts of the trail — wear boots and clothes that will stand up to mud! We will have shovels and rakes, plus pruners and saws for the places we will need to re-route the trail to drier ground. Check our Facebook page (https://www.facebook.com/Crozet-Trails-Crew-195317697171781) after 8 a.m. that morning in case we have to cancel due to weather. WORK DAY CANCELLED DUE TO COLD TEMPERATURE AND CHANCE OF SNOW SHOWERS. We will be improving drainage on the soggiest parts of the trail — wear boots and clothes that will stand up to mud! We will have shovels and rakes, plus some pruners for general trail clearing. I am considering offering a prize for the muddiest worker — come and see what it might be.